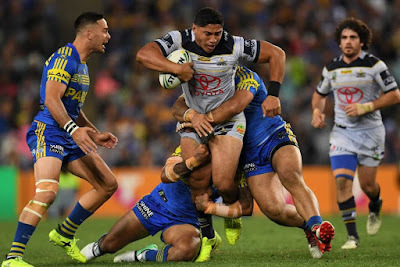 After what was an up and down season for the North Queensland Toyota Cowboys with injuries seeming to happen every week. The club was in serious trouble, The Cowboys were one U20/ QLD Cup player away from breaching the second tier Salary Cap which would have more than likely seen the club fined and docked competition points. But something changed mid season. After already losing Matt Scott in Round 2, the Cowboys lost the other Co-Captain in Johnathan Thurston after he injured his shoulder missing some time. But Michael Morgan stepped up, he put his hand forward and led what seemed like at most times a QLD Cup/ Holden Cup team. Fast forward a few weeks and Johnathan Thurston returned until further injuring himself in State of Origin which required that he received surgery on his shoulder and miss the rest of the season. Players like Lachlan Coote, Scott Bolton, Michael Morgan and new signing Te Marie Martin all stepped up and did what not man people thought they could do, and that was make the NRL Telstra Premiership Grand Final after almost missing the Top 8 due to the Canterbury-Bankstown Bulldogs defeating the St-George Illawara Dragons in Round 26. Fast forward to that Sunday night in October where the Cowboys took on the Melbourne Storm at ANZ Stadium, things did not seem to start well for the Cowboys after losing starting Prop Shaun Fensom only 2 minutes in due to a break in his Fibia and Tibia after a tackle went wrong which saw teammate Ethan Lowe fall off and land on Fensom's Leg. This was the start of what was to be a long night with the final score being 34-6 in favour of the Storm. After that night the Cowboys were praised on even getting to the finals with all the injuries that they had but they players never had any doubt that they could make it, they believed in themselves. Fast forward Two months and the Cowboys are ready to get back at it and fire up for the 2018 season. “Everyone was patting us on the back for the good effort we showed at the back end of the season, but you could tell looking at the boys faces that there was still that fire in our bellies,” Cowboys winger Antonio Winterstein told NRL.com. However both Winger Antonio Winterstein and Fullback Lachlan Coote are off contract at the end of next season and are both keen to stay. But when Coote was asked what was driving him for next year instead of saying what he wanted, he instead explained that there was a team goal. “Seeing the Melbourne Storm celebrating after the grand final is going to drive me again to be there again in October and lift that trophy again,” the 2015 premiership-winning Cowboy said. With key players returning and with the development of young players like Coen Hess and Corey Jensen getting valuable experience the Cowboys look to bounce back in 2018.